Sales VP Compensation - Sales Plan or Executive Plan? Should the head of Sales be on a sales compensation plan or an executive compensation plan? The right design for the VP of Sales’ compensation structure may be 100% sales-focused, 100% focused on overall business results or a combination of the two. Sales focused: The sales executive is primarily accountable for sales results, spending most of their time focused on managing and coaching the sales team, developing sales and market strategy. The sales executive may also sit on the leadership team for the business but always focused primarily on the contribution of the Sales function to overall business results. Business focused: The sales executive has a substantial role in the running of the business, with a strong influence over operational and investment decisions. In this case, the day-to-day oversight of the Sales team is handled by a strong Sales leadership team (or single leader) reporting to the Sales executive and fulfilling the roles listed in the Sales focused case above. Blended: The sales executive role is a blend of the two above, with up to 80% of their time focused on the Sales function, but at least 20% of their time focused on the overall management of the business. This is the most typical role for a top sales leader, and so the most typical VP of Sales compensation structure is aligned with this role type. In this case, it’s important to have the sales executive measured similarly to their sales team. So, if the sales team’s primary measure is Revenue, then the sales executive should also have significant variable pay based on Revenue. Measuring the sales executive on the same measure their team has is important for alignment, and the individual contributor salespeople like knowing their leader is “winning” or “losing” along with them from a compensation perspective. In addition to measuring the sales executive on the same core measure as the individual contributors on their team (Revenue, Margin, Bookings, etc. ), it’s also reasonable to hold the sales executive accountable for measures directly influenced by their team that are a bit closer to aggregate business results. Let’s explore some examples and options for compensation structure. A contribution margin is generally defined as [Revenue] – [Cost of Goods at Standard] – [Directly Controllable Sales Operating Expense]. And that last one generally includes sales compensation and the expenses directly incurred by the sales team like travel and entertainment and possibly samples or other similar items. This measure keeps the sales leader focused on delivering the sales results needed affordably, and on continuing to increase the sales production per sales person and per compensation dollar spent. Expense-to-Sales Ratio is a more direct measure of the sales efficiency noted above. For example, in businesses with a Margin measure as the primary metric for individual salespeople, this ratio might be calculated as [Directly Controllable Sales Operating Expense] / [Sold Margin Value]. “Linearity” is a word we’ve heard more and more recently, referring to the pace of sales through a year, quarter or month. The need to measure this comes from a tendency of sales teams to spike sales towards the end of a measurement period, especially in businesses where Booked Revenue is the primary measure (vs. Recognized Revenue). In many cases it’s not reasonable to expect individual contributor sales people to sell evenly through the year, especially if the business is “lumpy” (each year made up of a relatively small number of large deals). But in this case it may be reasonable to expect the sales leader whose results are aggregated over several sales people to deliver a more consistent level of sales through the year. Coaching Effectiveness measure reward the sales leader based on the number of sales people meeting or exceeding their goal for the year. This measure provides an incentive to coach and manage all members of the sales team, not just focus on the top producers to drive overall results. This coaching may represent a bit of an “investment” for the sales leader in the current year but should pay returns in the future via more capable a productive selling across the entire team. 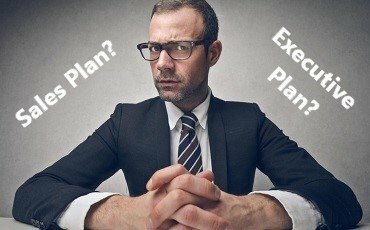 While each of these additional sales executive measures may be valuable for a particular business, remember the key principle that sales compensation plans are meant to focus effort, so it’s important to select a small number (three or fewer) measures focused on the most important results for the business. This type of role for a top sales executive is relatively rare, but it does occur, especially in businesses in which selling is a key competitive differentiator. If the top sales executive spends most of their time on the overall business then it is most likely appropriate to include the same measures that you’d find in the sales compensation plans for the rest of the executive team, placing them on the company’s executive compensation plan, including both a short-term incentive component based and long-term rewards like equity-based incentives. In this case, the sales executive will be rewarded for aligning the efforts of the sales team to contribute to the overall business results that the CEO and others of the executives are working to produce. After the Sales-focused type of role, this is the most common. Here the sales executive’s compensation is generally a blend of a sales-type plan and an executive sales plan. The challenge in this situation is to keep the number of measures to a minimum so that the plan doesn’t end up with 6 – 8 measures, each of which has relatively little value to the sales executive. In this case, consider how much time the sales executive is expected to spend managing the sales team vs. participating in the overall management of the business. The split here usually ranges from 70/30 to 80/20. The recommendation would be to put a 70% weight on the sales-type measures and a 30% weight on the executive-type measures. With 70% on the sales side, it may be practical to include both the primary sales measure (at 50%, for example) and a sales leadership measure from the list above (at 20%, for example). Then the remaining 30% could be based on a single measure from the executive plan (EBITDA, for example) or on the aggregate payout level of the full executive plan across all of its measures. Compensation supports focus and provides a “scorecard” to let people know how they’re doing against expectations. So the first step is always to be clear about the business objective for the plan – what does “better” look like in terms of the contribution of the sales executive. The next step is to be clear about the key accountabilities of the role. And finally consider sales compensation options that support the focus and results needed by the business.